When you have to pre-translate several documents or when you want to save many documents in a TM, you can save a lot of time by using MetaTexis' Batch processing feature. 1. Select an action in the Action list box. The following actions can be chosen: Convert to MetaTexis document, Analyze document, Pre-translate the whole document, Make document statistics, Save all translated segments in main TM, Make the final version. 2. Make settings as appropriate for the action selected. 3. Define the list of documents to be processed: Click the Add button to add documents (you can select more than one document). Click the Remove button to remove documents from the list. 1. To start the batch processing, click the Start button. The batch jobs are executed consecutively in the order of the document list. 2. Wait until the batch jobs are completed. A message box will inform you about the actions executed. You can stop the process at any time by pressing Esc on the keyboard. 3. When a batch job is finished, it is removed from the batch jobs list. 4. When all jobs have been finished or when you have stopped the batch processing by pressing Esc on the keyboard, the Log report dialog box will be shown. It contains a detailed report of the actions executed. 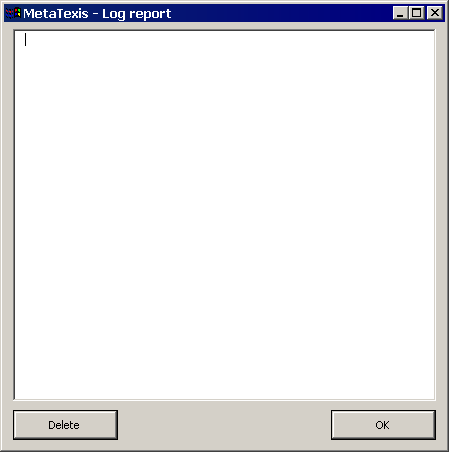 If no batch has been executed before, or if the log report was deleted (by clicking on the Delete button), the log report will be empty. 2. To close the log report click OK. Note: You can steer the batch processing function of MetaTexis also with an externally created XML file. The API for this function is available and can be purchased. For inquiries on functionality and pricing, send an email to sales@metatexis.com.